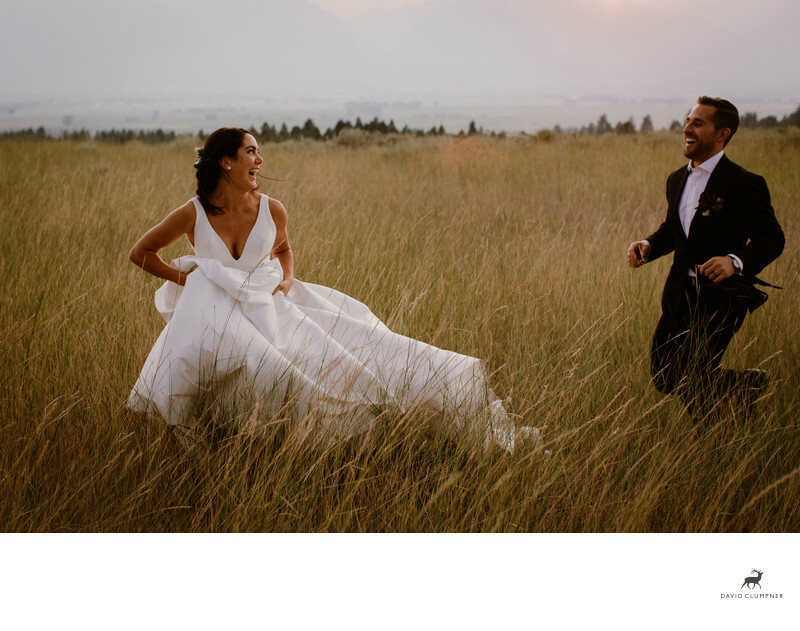 The Stock Farm Club is undoubtedly the premier wedding venue in the Bitterroot Valley. It is nestled on the foothills of the Sapphires on the east side of Hamilton, overlooking the Three Sisters of the Bitterroots on the west side. The Club is a private community complete with an equestrian park, a golf course, and a shooting range. Most lodging is through the purchase of a home inside the club, but Stock Farm differs from other private clubs in Montana in that you can also rent short-term lodging to stay. Ashli and Garrett's wedding was held on the lawn just outside the pool area overlooking the golf course. It was hot and smoky but the tent provided the necessary shade to keep the many guests cool. And fortunately their schedule was flexible enough that we could push the portraits to sunset, which turned out perfectly. Ashli had her heart set on portraits including the Bitterroot Mountains but due to the forest fires in Washington, which are often raging in August, we could barely see those peaks. I have photographed this valley before in similar conditions so I knew to wait until just the last moments before the sun dropped behind the mountains to get the right glow along the jagged mountain tops. We would only be able to get a silhouette, but it was better than nothing! We made sure to give ourselves plenty of time to lead up to that, which included a little frolic in a meadow next to the road. An impromptu run by Ashli had both Garrett and I confused, but I kept shooting and was elated to end up with this frame of their game of tag. This is perhaps the happiest photo I have ever taken of a couple.